With talk of a polar vortex and arctic blast, temperatures this winter have been miserable over most of the country. Even Southern states have seen snowflakes this winter, and northern states have experienced below freezing temperatures before even figuring in the wind chill. Since homeschool isn’t canceled due to bad weather, now is a good time to teach a lesson about the rare weather the country is experiencing. In an article on weather.com, Chris Dolce points out that while the term polar vortex has become “a popular catchphrase to describe the blast of bitter cold air,” it is a misleading term. It just so happens that the polar vortex, which is always pushing cold air south in the winter, is extending further south than usual this winter. Use Christian Kids Explore Earth and Space to learn about winter weather. Unit 5 is an introduction to weather and seasons, cloud formation, thunderstorms and tornadoes, hurricanes, and precipitation, including lessons on rain, snow, sleet, freezing rain, and hail. In Northeast Ohio, we even experienced a rare snow event known as snow rollers in open fields in the area. 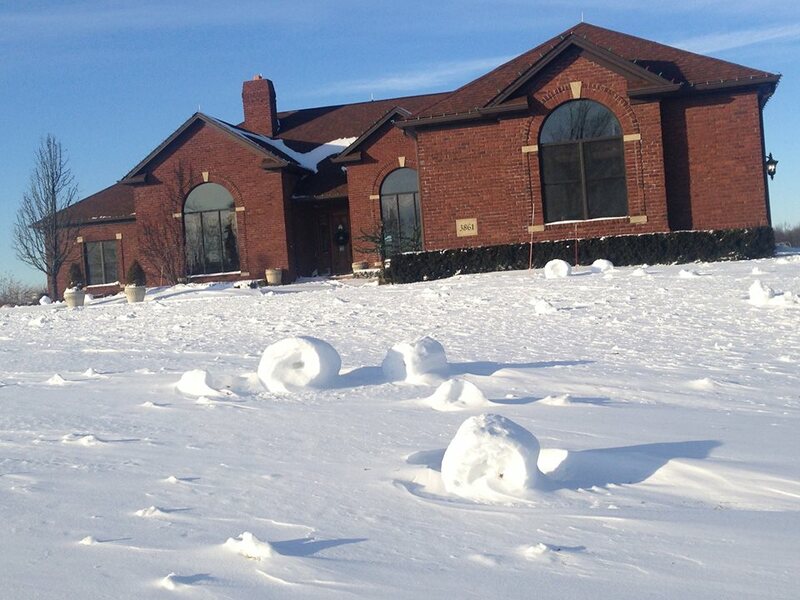 Snow rollers are the result of a perfect mix of snow and wind. These giant snow tubes aren’t only a great addition to your winter weather lesson; they’re just plain cool! 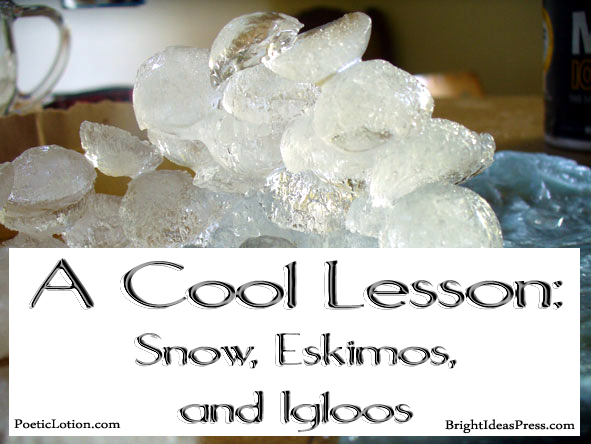 Learning about the Arctic and snow is a perfect opportunity to learn about Eskimos and igloos. Did you know that the term Eskimo is offensive to some? Many people living in Canada prefer the term Inuit, which means the people. However, those living in Alaska, still prefer Eskimo, since groups other than Inuits live there. Take time to teach your children about Eskimos and the Inuit culture. I’m sure you’ve heard the statement that Eskimos have many different words for the term snow. But did you that’s not entirely true? An article on Mental Floss by Arika Okrent, a linguist, explains how the language has many different words for everything, not just snow, and it is related to how they form thoughts and sentences using base words. Also Eskimos don’t live in igloos anymore. Well, actually they do, but not in the type of igloos that we think. The word igloo means house. So, in that sense, they do live in igloos, but they no longer make houses of ice. Are ice houses cold? Does it feel warmer or colder with snow on the ground? Having been born and raised in Ohio, I have had the pleasure of making snow forts as a child. They were always so warm. They cut off the wind and you never felt like you were surrounded by snow. Even as an adult, you tend to notice that it feels much warmer when there is snow on the ground. It insulates us and is truly a blanket of snow. If you live in an area with snow, bundle up and make a snow fort so that your kids can feel the difference. If not, try making this indoor igloo with your students. You can use regular ice cubes or specialty trays, but you’ll need plenty of ice, so you might need to save it for a few days in the freezer until you collect enough. Set up a working area on a table. Put a thin towel or some paper towels to catch the melt-off. On top of the towel, I recommend placing a sturdy piece of cardboard. I drew a pattern for an igloo directly on the cardboard, but you can use the printable I made, if you prefer. Place ice cubes along the pattern to create the first layer. 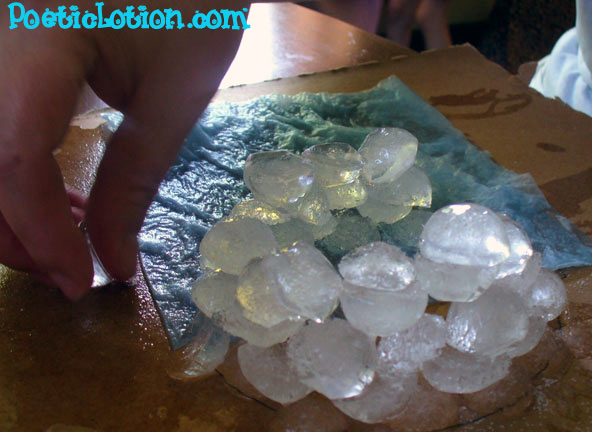 Sprinkle a little bit of salt over several cubes and begin building your second layer. Don’t salt the entire circle at once, because you won’t be able to work that quickly. After you sprinkle salt, you need to hold a cube where you want it. You’ll need to keep it there for a few seconds and then it will stick. Salt makes ice melt. But ice on ice is cold, so it will refreeze again, as long as you didn’t use too much salt. While your students make the first four layers, you can discuss how salt is used on the roads in the winter to melt ice and snow. 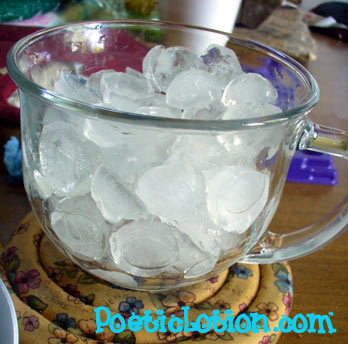 You may even choose to do some of many salt and ice science experiments available on the internet, like this yummy one for ice cream! After about four layers (or more, depending on your preferences), you can begin moving your bricks towards the center to create the roof of your igloo. Move gradually and take your time so that it doesn’t topple over. You can also start closing in the tunnel doorway. This project is great for older kids, who can make the igloo themselves. Little ones will enjoy it, too, but you will probably need to do most of the work. Snow days may traditionally mean a day off from learning, but with lessons like these, kids will be begging for more! How do you make the most of your snow days?